Just finished creating this design this evening—a hand stamped and personalized necklace. The sterling silver leaf-shaped charm has the initial of my son. I’ll be adding another leaf to this cluster of charms with my daughter’s initial on it. The attraction of hand stamping is that you can stamp text and names of your choice. This design and many others in my shop make perfect gifts for mamas (and papas! )—each one is unique. 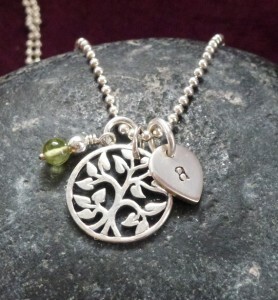 Oh, and that is a sterling silver tree of life charm. I wrapped a peridot gemstone bead for a bit of color!